We’ve been in the habit for too long of buying muffins at Costco to eat for breakfast and afternoon snacks. You know the ones—they are enormous, more like small cakes than real muffins. For the last month or so we’ve been trying to avoid them, seeking out weekday breakfast alternatives like almond maple granola, banana bread, and zucchini muffins. The apple muffins I made today will be going into the regular rotation. I wanted a finished apple muffin that did not resemble the oatmeal-streuseled, maple-glazed variety from Costco. 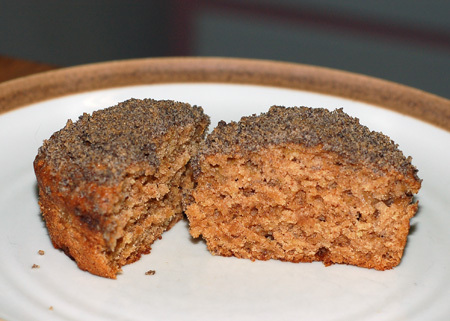 Those contain large slices of apple that render the surrounding muffin soggy and slither out whole when you take a bite. Instead, I decided to use a fresh applesauce of roasted Fuji apples, leaving it just chunky enough to be an obvious presence in the finished muffins. The applesauce and batter were both lightly sweetened and flavored with cinnamon and ginger, and I added a bit of wheat germ for oomph (pardon the technical terminology). I’m a huge fan of streusel toppings on pretty much all baked goods, but for this muffin I wanted something slightly different. Recalling an affinity between apples and buckwheat, I decided to make a buckwheat crumb cap very similar to my beloved buckwheat cookies. I pressed this sandy mixture on top of my muffin batter, thrust them in a hot oven, and crossed my fingers. The finished muffins are very moist and tender inside, with a clear apple presence and no mushiness. They aren’t overly sweet, the spices are a perfect foil for the apples, and the buckwheat crumb topping adds a contrast of texture, not to mention that mildly caramel-resonant flavor that makes the cookies so addictive. I consider the recipe an out-and-out success, except for the fact that it only makes about a dozen muffins: we’ve already eaten half the batch and breakfast won’t roll around for another 12 hours. 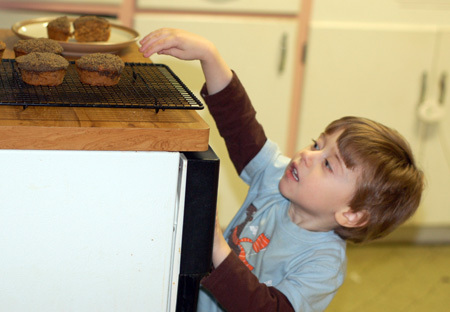 Nolan loved these muffins from the moment he laid eyes on them, still piping hot from the oven. As has become his custom whenever I bake, he started circling the area as soon as I set out the cooling rack. Then, while I was momentarily distracted by photographing a sample, he made his grab. That child has an amazingly long reach! Preheat the oven to 350F. Beat the butter and brown sugar together until light and fluffy. Add the egg, and beat to combine. 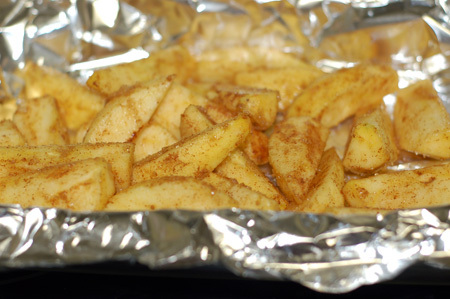 Add the applesauce, baking soda, salt, cinnamon and ginger, and beat thoroughly. Finally, add the flour and wheat germ, and stir just to combine. 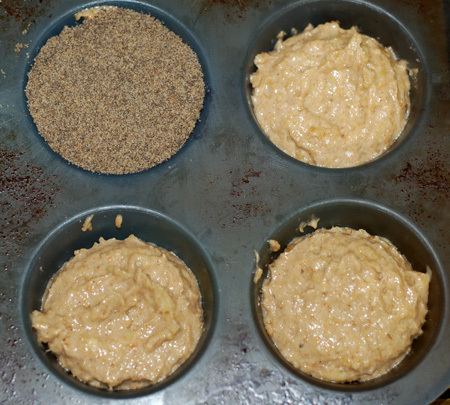 Scoop the batter into the wells of a lined (or greased, or silicone) muffin pan in 1/4-C doses, for a total of 11-12 muffins. Meanwhile, combine the 3 T all-purpose flour, buckwheat flour, brown sugar, butter and salt in a food processor and pulse until the flours are combined and the butter is cut into the mixture in fine crumbles. 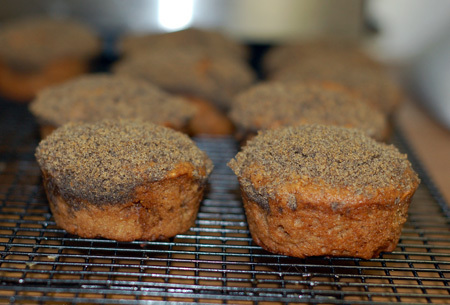 Scoop about a tablespoon of crumb topping over each muffin, and gently pat it down against the batter. Bake the muffins for 30 minutes, until puffy and set in the center, and try not to devour them all in one sitting. Source: Freely adapted from Kayotic Kitchen. Update 5/30/13: Revisited these muffins using part home-canned applesauce and part apple pulp from juicing, along with the following substitutions: coconut oil for butter, hemp seeds for wheat germ, turbinado sugar for brown sugar in streusel, oat flour for AP flour in streusel, allspice for ginger, part sprouted spelt flour for AP flour in batter, reduced brown sugar in batter to 1/2 C. Baked for 22 minutes at altitude and that was just about right.